Want to make shopping easier? Knowing which colors look best on you is helpful for buying clothes, make-up, and glasses. Wearing the correct tones is easy to do and can work wonders on providing an overall make-over. The question remains, how can you tell if you have a cool skin tone? 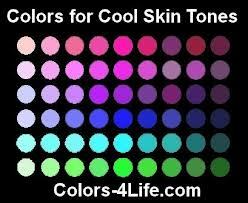 You have a cool skin tone if….